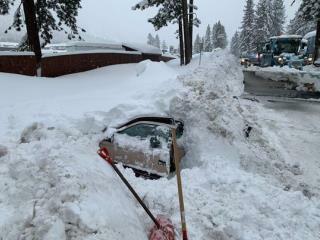 (Newser) – A snowplow driver in South Lake Tahoe, California, may have saved a woman's life by accidentally hitting her buried car. When he heard the collision, the snowplow operator called police, and he helped authorities dig the car out so it could be towed. It was only when they saw a hand against the window that they realized someone was inside, reports the Reno Gazette Journal. They pulled out a 48-year-old woman, who was uninjured and said she had been in the car no longer than five hours. Seriously, that happens. Lost of my Porsche Targa one day back in the mid-Eighties for several days to the snow burial, after abandoning to hike out of a storm. Slip sliding away. She was probably and her phone and didn't even notice her predicament. California and the SouthWest have been getting absolutely hammered. The unfolding Grand Solar Minimum has begun and this will only get worse, likely lasting centuries. This is the easy part not even as bad as the PDO induced cooldown of the 50's, 60's, and 70's. We are heading to temperatures below the mini ice age and there is not stopping it.